The G.O isn’t much of a shopper but he loves a good t-shirt. The proper shop had it but only in S. The G.O. wears XL but new sizes will be in next Wednesday. They weren’t. Repeat. Repeat. Shop owner’s evil twin personality guarantees we’ll never go back there. www.siam7.com (Thailand) don’t have the design in a t-shirt. www.alltshirts.com (France) doesn’t ship to Australia. Found it on eBay in the UK. Ordered and dispatched. Me: Are you able please to track where this order is at and advise me. I understand there may be some delay while it clears customs but it was dispatched 3 weeks ago tomorrow and usually OS delivery of similar items is around 2 weeks. Seller: Unfortunately there’s no tracking number available. But like you say they normally take no more than 14 days. If nothing in the next few days then let me know and I’ll sort something out for you. Usually if they take this long they end up back with me in a few months with a reason why. Me: I still haven’t received this item. Please advise what options there are. Seller: It looks like it has encountered some problem along the way. I can either try and get another shirt in the same design to send you. Send out another design should you be interested in any other’s I have listed in ebay. Or I can offer a full refund. Please advise what you would prefer and I’ll sort it out for you. Me: It was that specific t-shirt I wanted in XL. Obviously should both turn up I’d return one to you. I’m happy to meet you halfway with costs & also pay for trackable shipping. Seller: I’ll be visiting my supplier in the next few days. I’ll try and get another XL in the same design for you. I’ll let you know how I get one as soon as I’ve been. Me: If you have trouble sourcing another T-shirt just cancel the order, refund whatever you think is fair, and I’ll try to find another one myself. Seller: Would a size L or XXL be any good for you? Just I’m going to get new stock either Monday or Tuesday and thought maybe that could be an option if still no XL’s available. Me: He has other Billy Eight TShirts and the XL is the right fit – definitely not L – too small, and an XXL would be too loose. Seller: I have this one Item number: 130662034561 in XL but I can get others. But they’re not listed on ebay as I haven’t had time. What sort of design do you like? If the one I have is no good for you I’ll look for a similar design to what you like. If not we’ll just go with the refund. 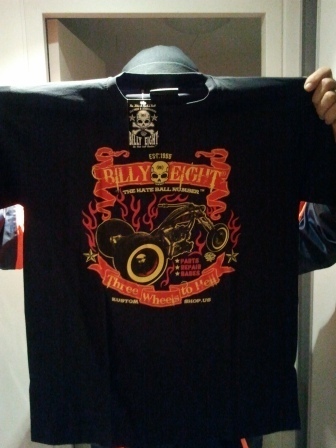 Me: I looked at #130662034561 but particularly want the Billy Eight Men’s Biker T-Shirt Three Wheels to Hell Tricycle Design Brand New Black XL, as ordered. It’s unfortunate that the original shipment went astray. Please refund if you can’t re-supply. I will let you know if the original shipment does turn up. Seller: I’m going to my supplier again tomorrow and they are due new stock. So I’ll give this design one last try and if still no luck then I’ll send your refund right away. The original one is most likely to have either gone awol or damaged in transit. Though I also think a few are going missing due to a rogue delivery lad I used for post etc… as this is not the only one to have ran into problem. I’ll let you know how I get one tomorrow. Me: I received your note re the refund. Thank you, and thank you for all your efforts to provide a replacement. I hope you don’t continue to experience these issues. Seller: Many thanks for your patience and understanding. No matter how many times I try and help people out by giving them some work it always comes back to one thing. I’m better off just doing everything myself! This entry was posted in Blog and tagged Australia, humour, my life. who was who, who was ere? Mmmm. I have started to dabble in this on-line order thing, myself, especially with regard to books for schooling my girls. Even tried grocery shopping a couple of times. (The delivery fee is cheaper than the cost of petrol to get into town from our village, but somehow it just never runs quite as smoothly as I anticipate it will as the start of the exercise. Perhaps I am not tuned in to the process, but perhaps I too just need to persevere. Great shirt, but ARRRRGGGGHHHH! What an effort!